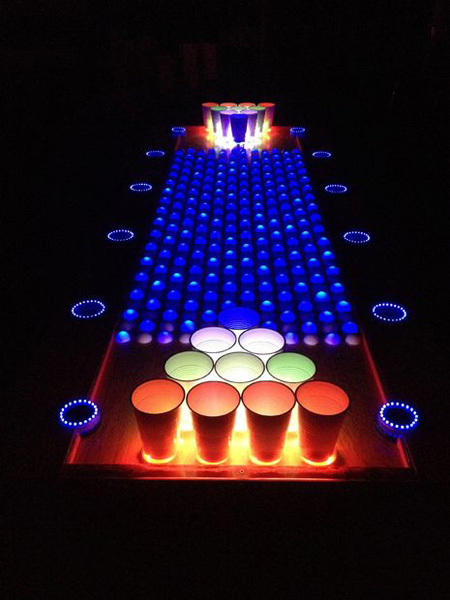 8 foot portable beer pong / flip cup table. Table measures 8ft long x 2ft wide and includes 4 Ping Pong Balls! 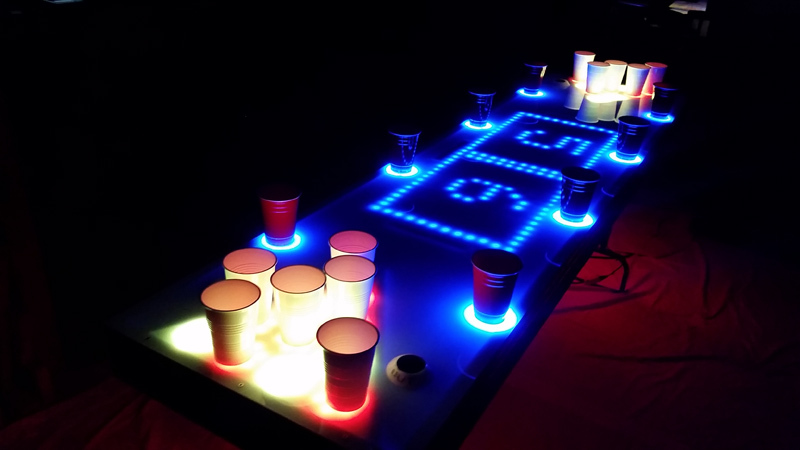 Beer pong rentals are perfect for: hosting a tournament, fraternity parties, block parties, tailgating, holiday festivities, birthday bashes, game night, work functions and bachelor/bachelorette parties. There is an air bath on each side of the table. The purpose of the air bathes are to blow any debris off of the ping pong balls, thus cleaning them. When a player drops a ball to their left into the “IN” hole of the air bath, it detects the ball and starts a fan. This fan will move the ball down a pipe, removing debris and blowing it out the “OUT” hole to the right of the player. The player then grabs the ball and the air bath shuts off. Players can also dunk the ping pong balls in a cup of water before putting them into the air bath to get a better clean. The built-in microphone can detect audio around it so the table can dance to different frequencies in the music around it. (Sorry, cups and beer are not included in the price of the rental.) Bring Your Own Drink!